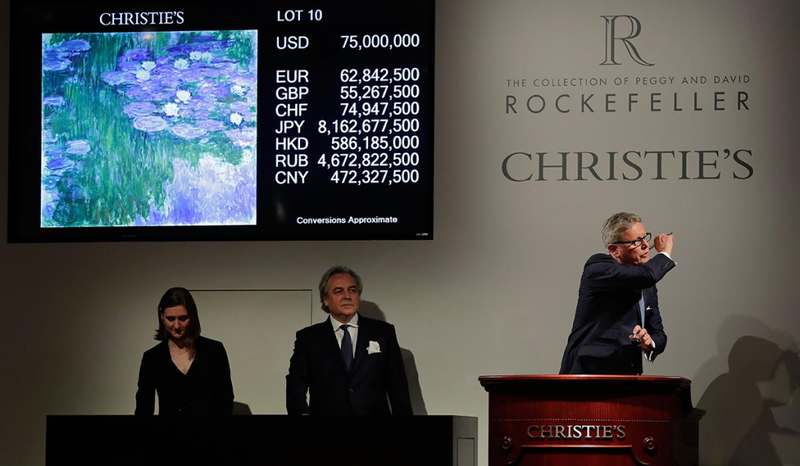 On the first night of the highly anticipated Christie’s auction of 19th and 20th century art from the Rockefeller collection, sales exploded and topped $645 million, breaking records. The previous one-day record was held by the Yves Saint Laurent auction nearly a decade ago, with a take of $484 million. The auction by Christie’s took place May 8-10 inside Rockefeller Plaza, which was built by John D. Rockefeller almost a century ago. The live auction is supplemented by an online auction, which ends May 11. The auction features more than 1,500 lots from the collection of David Rockefeller and his wife, Peggy. David Rockefeller died in 2017, aged 101. He was the last surviving grandson of John D. Rockefeller and also held the distinction of being the world’s oldest billionaire, with a fortune exceeding $3 billion.